In some areas of Palestine it is called (taqiyet elyahoodi) which means Jew’s hat, in some other areas it’s called (dinen) which means ears. However, the mainly and commonly used term is Shishbarak or Shushbarak. 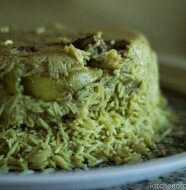 Although it is a very old dish that it’s believed to be originated hundreds years ago, shishbarak is still considered as one of the distinctive dishes of Levantine cuisine nowadays. Shishbarak is a light and mild main-dish that takes hours of preparation. Mainly consists of small pieces of beef-stuffed dough cooked in yogurt sauce, flavored with fried garlic and seasoned with fresh coriander. 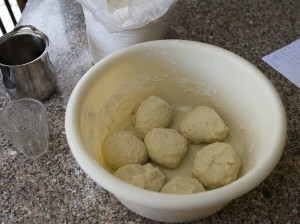 For the Dough: In a medium size bowl, combine flour, olive oil, vegetable oil, and salt. Rub the mixture together until oil is well combined into the flour. Add half cup of warm water gradually while kneading using one hand (add more water if the dough is dry or flour if it is too sticky). Add some vegetable oil to your both hands and try to form the dough to a ball and then cut it into hand-size balls. Cover the bowel for about 10 minutes to rest. For the Filling: Meanwhile, in a frying pan, add olive oil and onion and stir for couple of minutes until onion becomes slightly golden in color. Add meat, cover the pan and leave it on a reduced heat for about 10 minutes or until meat is cooked. Stir from time to time. 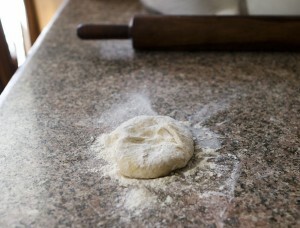 For the Dumplings: Roll each of dough balls on a soft and floured surface using a rolling pin. 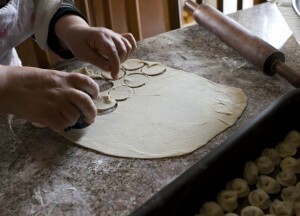 Cut the rolled dough into thin circles using an inverted small glass (the smaller is the glass, the smaller is the dumpling). 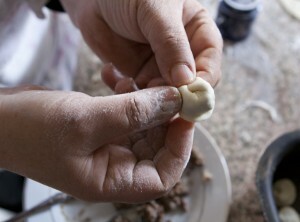 Add meat filling to each circle of dough and fold it into half. Seal the edges very well. 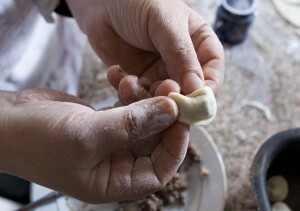 Bring both corners of the filled dough together in order to make a proper form of shishbarak dumpling. 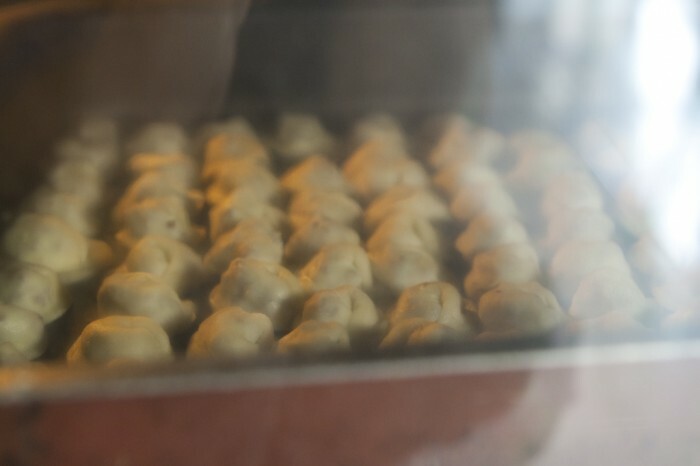 Place all dumplings in a tray and put it in a preheated oven for 8 minutes (4 minutes for each side, above and below). 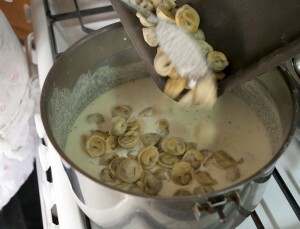 For the Yogurt Sauce: Blend both yogurt and cornstarch and place them in a pot over medium heat. Keep stirring continuously from the moment you place the pot over heat until yogurt is boiling. After having the yogurt cooked, add soaked rice and chicken stock. Leave rice for about 15 minutes until it’s cooked. Meanwhile, in a different small frying pan, fry garlic and coriander and add them to the yogurt sauce. 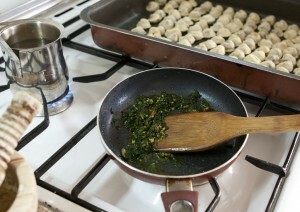 Add baked dumplings to the yogurt sauce just before serving, cook over a medium heat for about 10 minutes and serve hot. 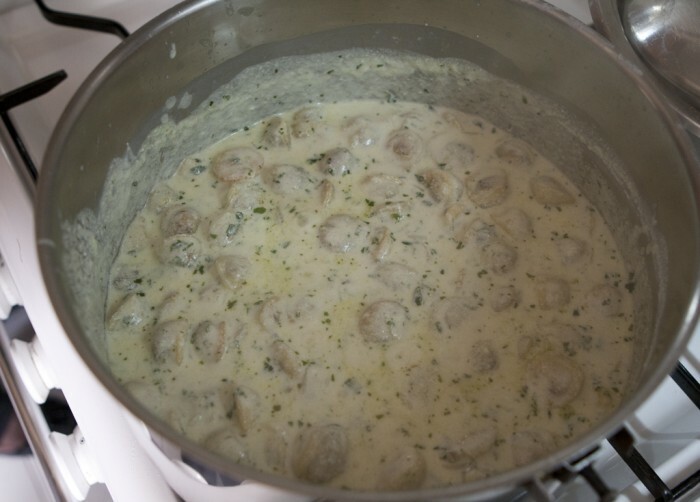 19 Comments on "Meat Dumplings in Yogurt Sauce (Shishbarak)"
As much as I love shushbarak, I cannot help but feel sorry for how fast this meal is devoured, compared to how much time and effort it takes to prepare it. 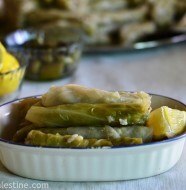 Stuffed vine leaves share the same cooking tragedy. Next time, take your time eating it! And try to enjoy and appreciate every bite..
Hahahahaha :) Oh my god Rami I was thinking exactly the same! Now that I saw the recipe in details i feel sorry for my mother! 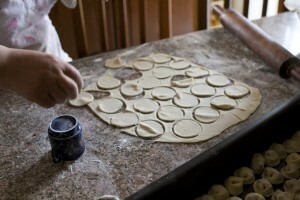 great post Ammoon… walla I can smell the baked dough in reality because of the pictures! I’m sure Muna enjoys cooking a hundred times than eating.. Thank you loza for your supportive comments.. I love you! I make them with sour cream and dry labneh, we call them CAT EARS. Interesting! 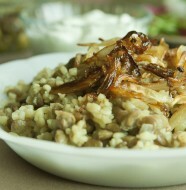 sour cream and dry labaneh would give a stronger and a richer flavor. I will try them one day, thanks for the tip. Great! I’d love to see them. Can you send them to emanbushnaq@gmail.com? I really want to try making these, but I wondered if they’d taste OK if I used a passatta sauce rather than yoghurt sauce? Any opinions on the idea? Yes. 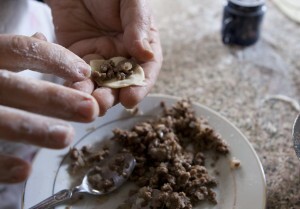 Passata sauce would make a great option with meat dumplings just as with tortellini.. 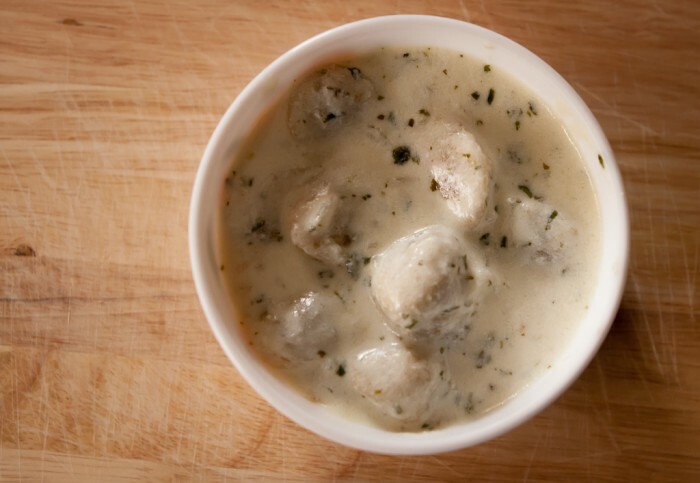 However, meat dumplings with yogurt sauce has a totally different taste and it’s really good.. It’s worth trying! I would divide the dumplings and try them with both sauces :) how about this? Hello, I’m glad to find your site. 40 years ago I was in Lebanon. One woman of the family where I lived was cooking a kind of meat with ghee or something else with spices for a long time. After that you can use it to prepare eggs. It was very delicous and I’m looking for the correct recipe. Can you help me? Thanks and greetings. Bridget, You are talking about Awarma. Love your recipes, makes me hungry! Hi, where/what brand should I buy the yogurt from? May I have the recipe for Awarma?